Burbank, CA – This weekend the Martial Arts History Museum will be hosting a unique healing and wellness seminar hosted by world renowned practitioner Sifu Matthew. Through the understanding of electromagnetic forces of the body in relation to strength, wellness and healing, he has helped thousands of people including pro athletes, Hollywood stars and veterans to develop a better performance level in their health. The seminar will begin promptly at 2 pm. Sifu Matthew provides an afternoon of learning about the secret science and power of interacting your highest potentiality. “The body is an electromagnetic instrument that communicates using proven physic forces. By learning the system to harness these forces you can create astonishing changes at will for all arenas of your life,” notes Sifu Matthew. 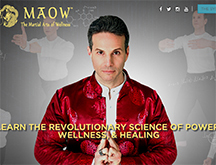 Healer and founder of MAOW (The Martial Arts of Wellness), Matthew will enlighten others to achieve their optimal performance through changing their cellular structure to increase the healing process of injuries, reduce stress through mastering your magnetism, enter your optimal zones of power and learn about unearthing your inner force. The event, which will begin at 2 pm until 3:15 pm, will be at the Martial Arts History Museum at 2319 W. Magnolia Blvd., Burbank, CA 91506. Cost of the event is $40 (Half of all proceeds will benefit the museum). For information on MAOW, visit http://www.themartialartsofwellness.com. For information about the museum, visit http://www.mamuseum.com.